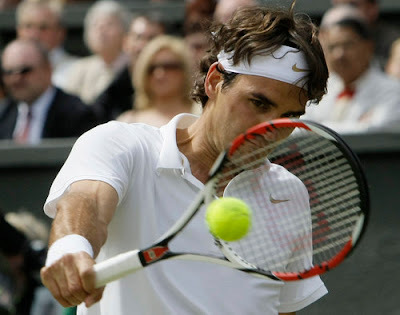 An Opinion On Sports: Nadal -vs- Federer: One For The Ages! astounding and the excitement unending. There were unforced errors of course in a match of this duration. Federer himself converted only one of thirteen break points, but there are only positives to carry away from an epic battle like this. For Nadal, he became the first player to win the French Open and Wimbledon in the same year since Borg in 1980. For Federer, his level of tennis has not deteriorated, guys like Nadal are just getting better. He also has to play at is highest level to win grand slam events now. Had he not come back from two sets down, he might have reason to question himself. But the comeback showed he still has the desire and the ability to continue to add to his 12 Grand Slam wins. What a way for a sports enthusiast to cap off a sports-filled Fourth of July Holiday weekend. I'm sure we'll be seeing Mr.'s Federer and Nadal many more times during their outstanding tennis careers.